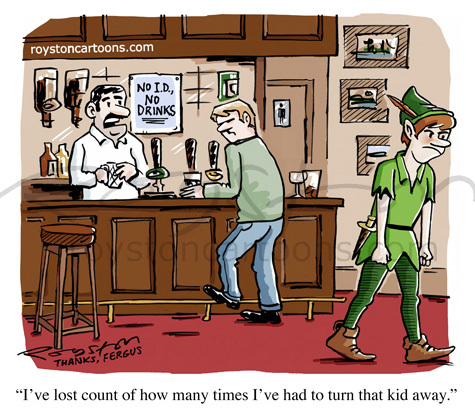 "I've lost count of how many times I've had to turn that kid away." My son came up with the idea for this cartoon, hence the "Thanks, Fergus" in the corner. His original set-up and wording was slightly different – an angry barman saying "I've told you before, you're not getting served in my pub and you never will!" – but I saw straight away that it was a good joke. So rather than asking why a young boy (he's just turned 11) is coming up with pub-based jokes I made a note of it. It can be seen in the July Reader's Digest and an appropriate pocket money adjustment will be made.